We all find inspiration in different places -- whether it's from art, nature, architecture, fashion or the millions of other sources; it's always so important to find out what that is for us. On any given day, I can find inspiration from the most random of things but on this particular day, I found it in the beauty that is Vancouver weather. It's true, I usually complain about our rainy days, but last Sunday we had the most amazingly unpredictable day. We ran outside as soon as we saw a stunning rainbow and decided to shoot the clothes I had just received from Denim & Supply and was in the middle of trying on. The clouds were moving so quickly -- going from bright, sunny and warm to dark, cloudy and raining. It was actually near impossible to shoot because the light was so extreme from one end to the other, but we were both just laughing and trying our best to get the shot. My very favorite is actually the last photo in this post because the rain looks so magical against the sun. It turns out that I was quite lucky I was in the middle of trying on these Denim & Supply clothes because I absolutely love them and am so happy that I was able to capture them on this day. I love a good ripped jean and I think these ones are the ultimate. How amazing is the zipper detail within the rips? So badass. And don't even get me started on the jacket. 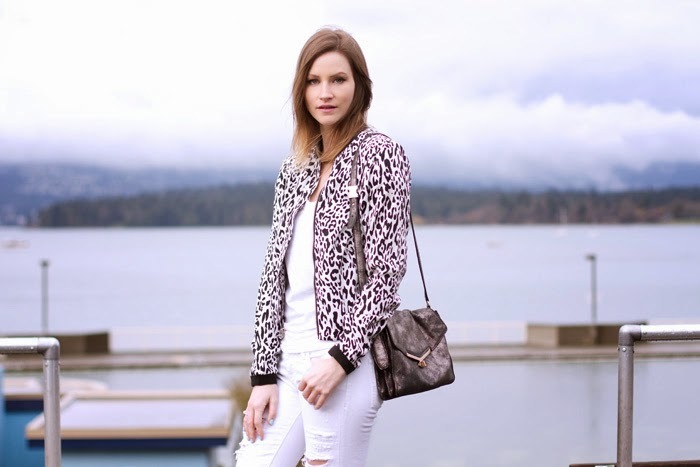 It really can't get much better than a leopard print bomber. Especially in black and white. A couple of Spring staples have just been checked off the list. I'm so happy to be teaming up with Denim and Supply by Ralph Lauren to show you the new Spring line which is now available at Hudson's Bay. Make sure to check out B Insider for your chance to win a $1000 Denim & Supply wardrobe! They really are amazing jeans! I really like them. Great photo; the last one is rad with the rain!